Since I work with WebLogic, 18 years now already, every year a new road-map appears about the new and coming features of Oracle WebLogic and this is presented during Oracle OpenWorld. While everybody is at this moment already back to business as usual, I’d like to give an overview of the already existing and new coming features discussed last year in San Francisco. Everything is "Serverless" – " No SQL" -"Low Code" – "SOA is dead", "Micro-everything and death to the Monolith!" Of course these terms does not fully represent what they appear to at first sight, but still, when you’re from the "old school server/ sys admin" I can understand it sometimes is dazzling and sometimes hard to put them all together. But when you look down deeper, you will discover the relationships between these terms and more in specific what they mean. WebLogic Server "Current" and "Next"
Nowadays, we don’t only speak of WebLogic Server anymore but also about the Java Cloud Service, which is WebLogic as PaaS. In this post I will give my view of the new and coming features. WebLogic Server will still exists as the key Java Application Server from Oracle, however it will be the " next generation " application server where old and new concepts go hand in hand. Especially the move to the cloud which is already happening for a few years will be more and more emphasized by Oracle. How ever, either speaking of WebLogic Server of Java Cloud Service, the features are pretty much the same so I will speak of WebLogic Server, it will also mean it’s Java Cloud Service. 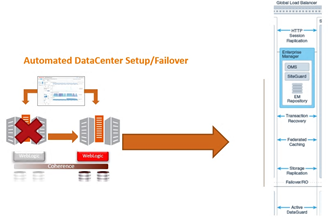 Multidatacenter availability with Oracle Traffic Director and Coherence and automated failover with SiteGuard. Read the complete article here.